Nothing makes me hungry like swimming does. After completing my laps I get so ravenous, I could eat everything in sight. More so than after the other vigorous cardio workouts I routinely do for triathlons (i.e., running and biking). It is said that the main reason for the increased feeling of hunger after swimming is due to the temperature of the water. When the body is immersed in cold water it expends energy to keep itself warm — in addition to the calories burned for swimming. No wonder after 50 minutes in the pool I could eat a horse. To calm down my hunger I usually keep a Lårabar in my bag to eat right afterwards. It takes away that initial eat “everything in sight” feeling and I am better able to stop and think about eating something good, rather than doing the binge thing. Still - by the time I get home - I’m famished again, so I always make sure to have an “eating plan” in place for my post-swimming meal. 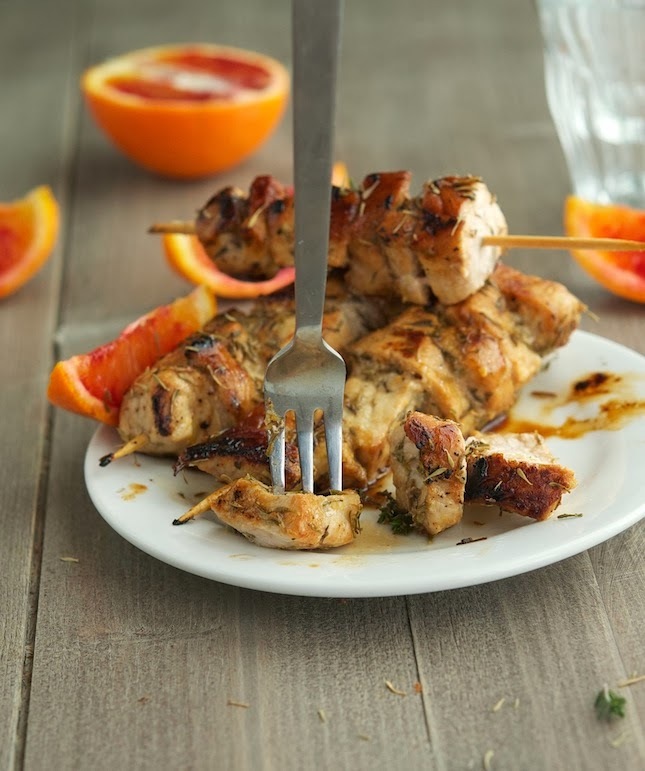 Ready in a little over 30 minutes, these pork skewers have a certain je ne sais quoi that makes them perfect for a post-workout meal. 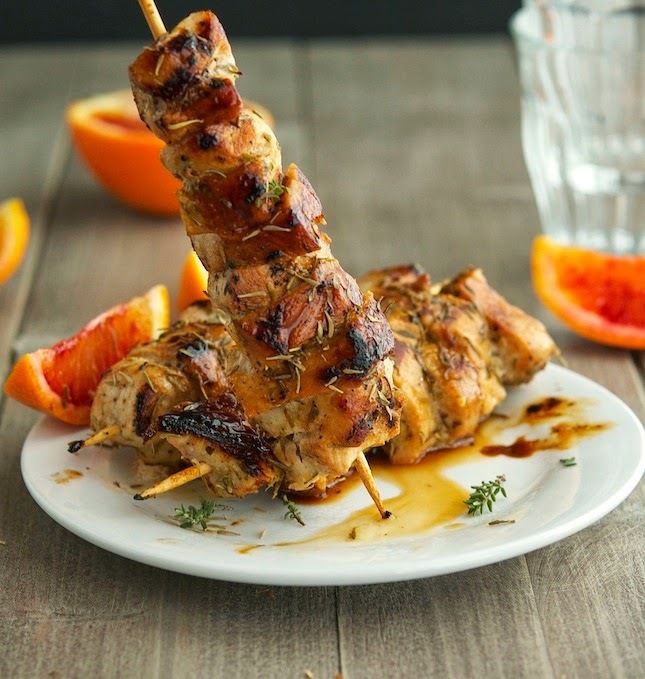 The orange’s slight acidity paired with the thyme penetrating fragrance work like a charm with pork; but lamb or chicken would also benefit from it. Serve them with crunchy greens on the side, and eat them with your hands. Cause life tastes better when you eat with your hands, and takes less time too! 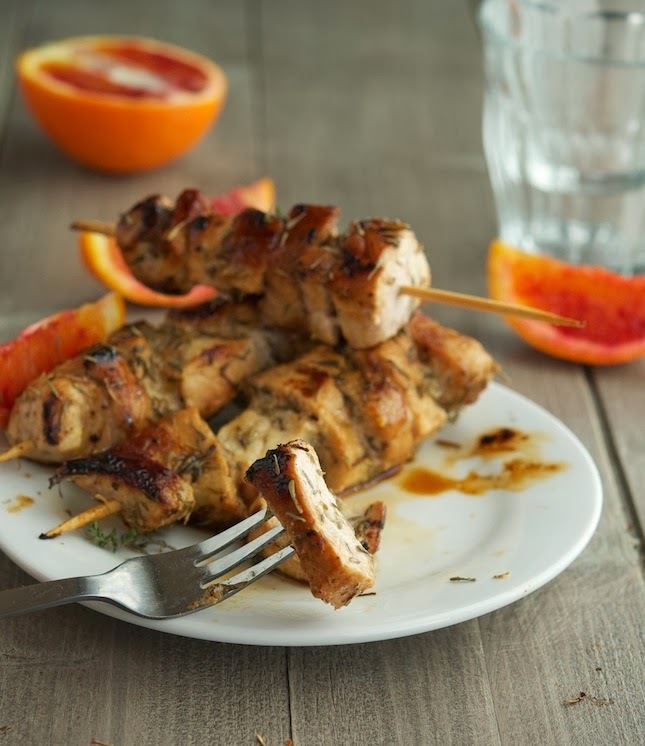 Orange Thyme Pork Kebabs Print this recipe! In a bowl combine orange juice, orange zest, garlic, thyme, mustard, salt and pepper. Whisking constantly, pour oil in a slow, steady stream until emulsified. In a Ziploc bag (or a shallow dish) combine pork chunks and orange marinade and let marinate for at least 20 minutes at room temperature. Thread pork chunk onto skewers (if using wooden skewers, soak them in water for 30 minutes beforehand), and discard marinade. Heat a grill pan (or a grill) over medium-high heat and grill pork, turning every now and then, until cooked through and slightly charred, about 12 to 15 minutes. Serve with orange wedges and thyme sprigs. One serving yields 370 calories, 15 grams of fat, 3 grams of carbs and 31 grams of protein. Yummo, I'm making this tonight for dinner! Okay, another one going on the menu! They look amazing. Awesome Lauren, you're now my official recipe tester! My mind is loving this flavor combo! 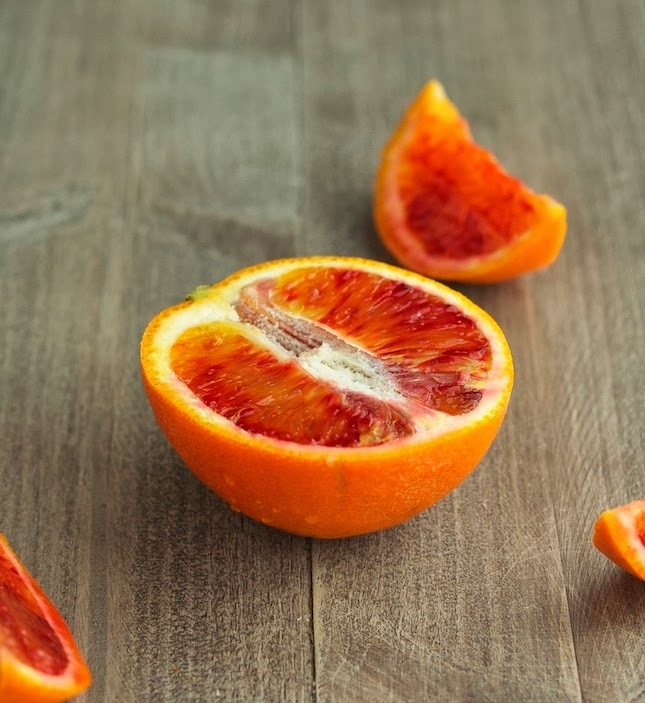 And my eyes are loving your beautiful oranges. And my tummy would love to love one of those mouth watering pork kebabs! No laps, no kebabs Sonia. I'm sorry but that's the way it is! Looks like we were both in an orange mood! And those kebabs look delish! 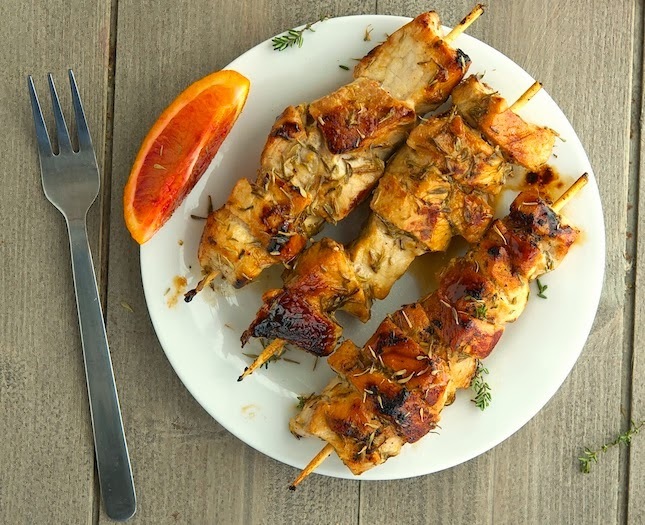 I love thyme and lemon - but never tried it with orange - BRILLIANT flavor mash up, my friend! Orange and thyme is a marriage made in heaven, you should totally try it! Your kebabs looks so amazing Mike. Can't wait to try these! Yummy! I might try these with chicken this week! I made them with chicken last night, just as good! I've always wondered how come I get ravenous after a swim, but I'm never hungry after hours running/cycling... I'm so happy I now know it, yay. 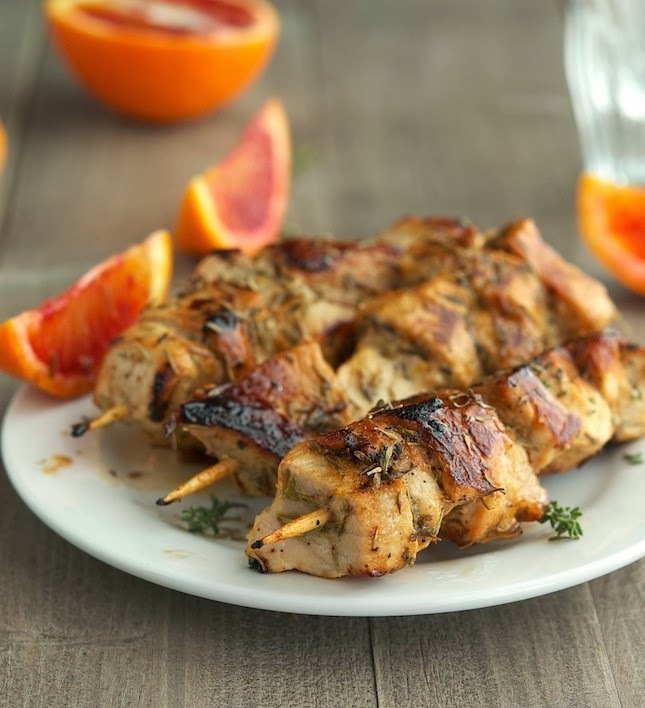 You should totally try these kebabs after swimming, there's no better time to enjoy them! "Cause life tastes better when you eat with your hands" YES! Haha, love that you said that!! 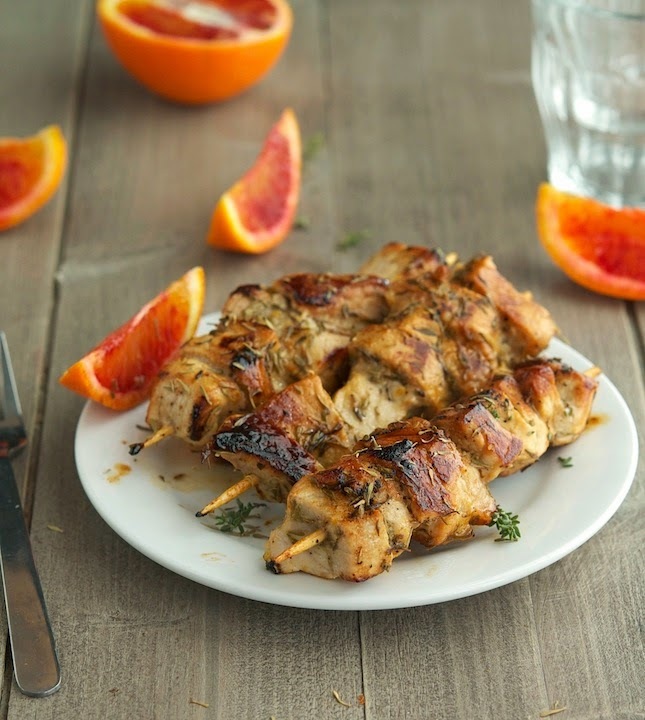 And these kebabs look freaking awesome... and totally digging the orange thyme marinade! Your recipe sounds great and I'm saving it for grilling season. Great photos, by the way. Can't wait to try this in about a month when all of the snow melts and I can open my BBQ! Thanks for sharing!! I just tried an Orange and thyme dressing for a salad and I couldn't agree more with you, It is a marriage made in heaven!